How Often Should a Person have an Eye Examination? 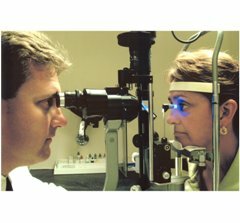 This article will discuss why it is important to have eye exams and the frequency of the eye exams. There are many reasons for having periodic exams. 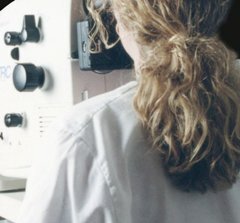 The frequency of an eye examination is based on the presence of an ocular disease or abnormality and/or the risk of developing an ocular disease or condition. People who have a systemic disease that has eye related diseases need to have periodic eye exams such as with diabetes mellitus. People with a family history of an eye disease should have periodic eye exams based on the ocular disease, age of the person, and the relative risk of that person developing the eye disease. There are different times in a person’s life when eye exams are extremely important. In newborns certain infections and congenital or hereditary diseases may present at birth and if not treated early can lead to blindness. Preschool children should have their eyes examined to see if they have any eye disease especially amblyopia or lazy eye. In children and teenagers myopia may develop and needs to be diagnosed. In healthy young adults up to age forty, eye diseases are not very common and eye exams can be less frequent during that age group. Unless someone in this age group has any ocular symptoms, an eye exam every 5 years or so is adequate. 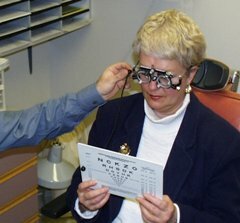 From age forty to age sixty four, an eye exam every 2 to 4 years. After age sixty five, an eye exam every 1 to 2 years is proper as we age eye diseases become more prevalent. Infants at high risk such as those that are premature have the potential of developing retinopathy of prematurity and need to be seen and treatment started if indicated as soon as reasonably possible. Infants with a family history of congenital cataracts, retinoblastoma, congenital glaucoma, or other genetic diseases should have an eye examination as soon as possible. Children should have an eye evaluation within the first couple months after birth, six to 12 months, around age three, and before starting school. This can be done by a pediatrician, optometrist, or ophthalmologist. School aged children should have their vision tested every two years. This is commonly done by the pediatrician, school vision testing programs, volunteer organizations such as the Lions Club, and Societies to Prevent Blindness. Young adults to age forty only need to have an eye exam every four or five years unless they are having symptoms, a family history of an eye disease that warrants periodic exams, or medical condition that has related eye disease or conditions. People aged forty to age sixty four should have an eye exam every two to four years routinely and sooner if there is a medical reason to do so. People age sixty five and older should have their eyes examined every one to two years unless there are medical reasons for exams more often. People who are newly diagnosed with diabetes mellitus type 1 before age thirty should have a comprehensive eye exam five years after diagnosis and yearly thereafter. Patients diagnosed with diabetes mellitus type 1 after age thirty should have their eyes examined immediately and yearly thereafter. People who are diagnosed with diabetes mellitus type 2 should have a comprehensive eye exam immediately and yearly thereafter. The frequency of eyes exams can vary significantly based on the presence of people having a medical disease that may have ocular consequences. Eye exam frequency can vary widely if there is a family history of an eye disease. The need for an eye exam varies on age of a person, family history, risks of developing an ocular disease and race. The frequency of eye examinations depends on the person’s race, family history, medical conditions, ocular disease, person’s age, ocular symptoms and the severity of the person’s medical or ocular disease.